Over the past 20 years our team has done every type of epoxy and polished concrete project you can think of. We're here to tell you that polished concrete is great, whether you're a contractor, painter, water-proofing specialist, builder, tile floor contractor, we can help you get into this niche and make more money for yourself. A lot of companies claim to do a lot of things, amiright? Sell you this, sell you that. We're different because we came from where you are coming from. We're contractors and construction guys that originally didn't know the first thing about polished concrete and epoxy flooring. Basically, we messed up every job that we got and had to pay someone to come fix it for us. That's why we developed our Polished Concrete University and Epoxy Training Center. Our mission is to teach contractors to overstep the hurdles that we struggled through ourselves. Sound good? Whip out your phone and give us a call. ​We're at 646-846-2224 You'll probably get Tony, he's an alright guy and he'll tell you everything that you need to know. There's a video from him below. We're psyched up to show you why we are the best and only one stop shop for epoxy flooring and concrete polishing systems. Training, Equipment sales, diamond blades, business planning, marketing support, you name it..
We will help you with every step of the process. Call us for any and all questions that you may have. That's why we're here! While many people have always considered New York City to be a concrete jungle, not everyone knows who they can turn to for home polished concrete services. From parking garages to living spaces, backyards to patios, showrooms and schools, polished concrete is the bomb if it's done right. We'll teach you the most effective installation methods and supply you with the best and most inexpensive materials. We're your go to guys when it comes to Polished Concrete and Epoxy Flooring. Period. When New York City contractors need to polish concrete for a new store they turn to NYC Concrete Polishing Equipment. We strive to be New York’s one-stop concrete shop with everything you could ever need for polished concrete services. 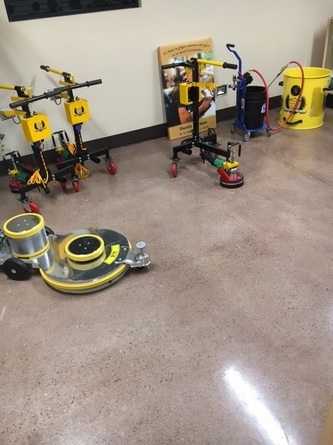 ​Whether you are an experienced contractor, need polished concrete for your home, are looking for affordable concrete equipment rentals, are purchasing supplies, or are interested in our concrete training and education classes, you’ll find it all in one convenient location. If you need an installer in Manhattan and you don't want to rent or buy a machine, we highly recommend Southside Concrete Polishing. They are the best Polished Concrete Company In Manhattan. ​​​​Polished concrete has all the long lasting sturdiness of conventional, dull, gray poured concrete but with the added benefit of looking great. If you want a showroom finish, then you need to do it right and here's how. The only limits of polished concrete surfaces are your imagination. When a professional and experienced team installs your polished concrete flooring, we can take your home to the next level with a uniquely designed floor option. Durable, long lasting, and with the perfect finish that best suits your needs, you’ll love how your new floors look. Another reason to love polished concrete is that the process is highly versatile. If your home already has existing concrete surfaces, whether in a basement, garage, or other spaces in your home, we don’t necessarily have to remove the existing flooring before polishing it. Polished concrete can be added retroactively in many situations, giving you a better finish faster with less work than other types of flooring solutions. You’ll find that polished concrete isn’t nearly as expensive to install as it looks, and it’s generally the easiest method to enhancing concrete flooring. The great thing about living in America and New York City is how many talented tradespeople we have living here. Because of that, our team offers polished concrete equipment rentals for anyone that isn't ready for the commitment of owning. Our rentals are fairly priced and will give you the ability to retain a healthy profit margin. Whatever tool or machine you’re looking for, we’ll have the right equipment for each job. You’ll always get the best results each time when you rent from us. We also have many different polished concrete supplies for sale as well. Because of these purchase options, we’ve become a hub for all things polished concrete in NYC. More flooring professionals trust us with their rental and supply needs over any other store. Rather than choosing low-quality equipment and supply options from a big box discount hardware chain, the true local flooring experts depend on us each time. If you’ve had an interest in branching out your flooring services or painting or waterproofing services to include polished concrete options, or you’re interested in learning on how to polish your own home’s concrete, we have great news. In addition to being Ney York City’s premier polished concrete rental and supply depot, we are also the most experienced team in training and educating others on polished concrete surface applications. Through our training classes and lessons, you’ll learn everything from the basics to advanced techniques that will give you an edge in polishing concrete floors and other surfaces. From polished interior floors to exterior living areas, countertops, garages, basements, and more, you’ll find everything you need to become a better concrete polisher. Whether you’re a professional flooring contractor or a Do It Yourself project enthusiast, we’ll give you the best training tools, tips, and techniques to set you up for success. And all other areas of expertise. Whether you’re looking to learn more, become a polished concrete flooring professional, or hone your skills even further, our lesson plans are perfect for everyone. It doesn’t matter if you’ve polished one floor or one hundred; we guarantee that you’ll learn something new to benefit from and discover more tricks and tips than you ever thought possible. If you aren’t quite sure that polished concrete is the best look and style for your home needs, but you do want to go beyond basic poured concrete, concrete sealer is an excellent first choice for your surface. 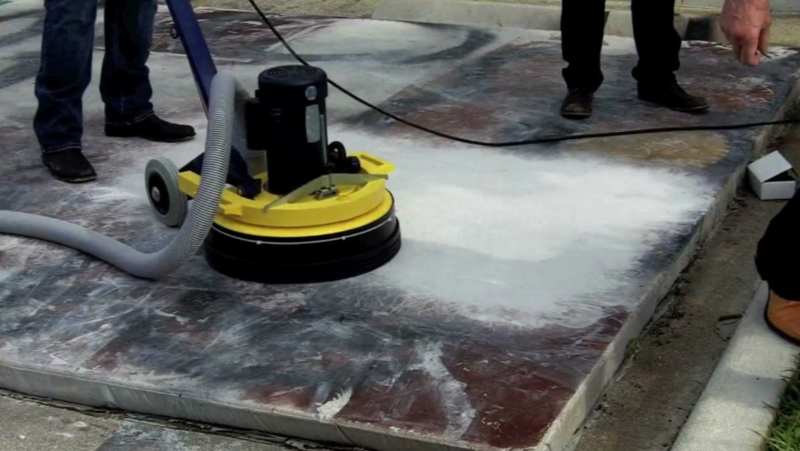 Concrete sealer does exactly what its name implies – by filling in the pores found on the surface of your concrete, your poured surface will last longer, look better, and require fewer maintenance options than before. Even if you choose to forgo polishing services for your concrete, concrete sealants can fight off corrosion, stains, make the concrete more durable, and reduce the amount of water and other liquids the concrete absorbs. The result is a smoother looking concrete that performs better for longer without costing a lot of money. We use the best concrete floor sealer products to give you the best-sealed floor possible. It’s no secret that our team offers the best options for polished concrete surfaces. We offer professional grade concrete grinder supplies to give your home the level of smoothness you’re looking for and that you can take pride showing others. In fact, many times people will think you’ve complete replaced your concrete surfaces with other flooring options! In addition to simple polishing finishes, we can also provide all the tools you need for stained concrete floors to maximize the level of personality and customization that you’ve always wanted. When you need to transform a dull, flat gray floor surface into something vibrant, playful, or artistic, we can recreate any design or idea that you have for your floors. Make your home truly yours with the best in polished flooring solutions. Don't take a shortcut on your concrete floors. Half of polished concrete companies business comes from one person starting the job and doing it incorrectly. We're here to help you do it right the first time. We strive to offer comprehensive polished flooring options. From having top name brands, more supply options, and better pricing to teaching the next generation in professional flooring experts, we save you more money than anyone else. And it’s been this dedication to quality over cost that has made us the most trusted name in local polished flooring choices. Other companies may not rent equipment at all, only leaving the option of paying more for low quality equipment. Or if they do offer equipment rentals, they’re usually always old, worn out machines that just don’t perform at the level that you need them to. But we take care of our equipment, making sure it’s in the best condition possible before you use it for your home or job. When you need concrete polishing equipment that will work as hard as you do, then look no further than us for your needs. 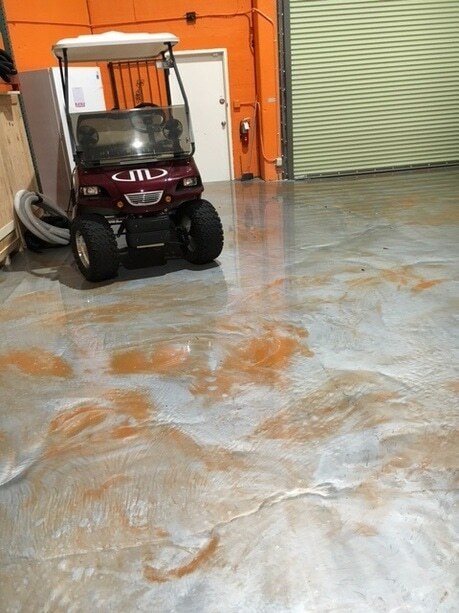 A question that we receive here at NYC Concrete Polishing Equipment is, “what is epoxy flooring”? Home epoxy flooring has a similar look and sheen that polished concrete has, but it is achieved through a different application. Epoxy flooring comes from multiple coats of an epoxy application that is added to an existing flooring surface, usually the concrete floor found in many homes’ garages. Epoxy garage floor solutions are popular for the same reason polished concrete is; it can achieve a unique look that poured concrete simply cannot have. Different flooring supplies are used to achieve these looks. For instance, for a more industrial or “Space Age” look, a homeowner may choose to have metallic epoxy installed. For a more car showroom finish look, they may opt to have glitter epoxy used instead. Or, if they want to keep epoxy flooring cost low, they may have a simple colored epoxy used for their garage. Rather than retain its hard concrete feel, epoxy flooring has a more “rubbery” look and feel from the painted on application. Because epoxy floors run from relatively cheap to moderately expensive, many turn to simple DIY applications. However, the more advanced (and expensive) options should not be a DIY epoxy application; while the Internet may have some great garage floor tips to learn from, advanced epoxy applications are not for the first timers. Our goal is providing the all-around best experience to our customers. Before you commit to using us, we can provide you with a free, no-obligation quote on all of your polished surfaces inquire. Rest easy and be confident, knowing you’re getting the best deal possible on your best flooring. We’ve always offered the best value on polished flooring, countertops, exterior surfaces, and garages and basements, and we’re prepared to back it up. Our crew consists of only the best local New York City floor polishing experts, giving you a quicker, better floor polish than anyone else. When you choose us, you’ll save time and money and have a better-polished concrete surface than with any other competitor. When you need the level of quality and service that you can’t find anywhere else, NYC Concrete Polishing Equipment is there for you each time. Call today and let us make your floors look great.